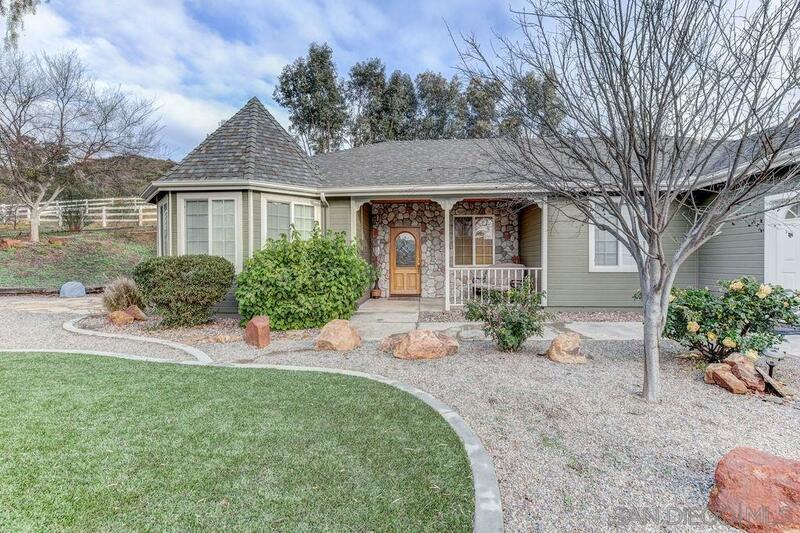 Secluded home set back off the road on a rare 1.1 acre parcel in San Diego Country Estates. Great room floor plan has vaulted ceilings, recessed lighting, and open to upgraded kitchen w/SS appliances, granite counters, center island & pantry. Spacious master suite on one end of the home with other 2 bedrooms & bath on other end (office/den in middle). MD Shedrow 2 stall barn w/paddocks, 100x80 fenced turn out, wash rack, hay storage & abuts riding trails. 3 car Gar w/custom storage. Various fruit trees., Room for horses & a pool! MD Shedrow 2 stall barn 12x16 & 12x12 with paddock. Wash rack, hay storage, backs to open space and riding trails, 100x80 white rail vinyl fencing turnout area. NO WATER BILL! property is serviced by a private well with filtration & softening system. 10x10 concrete floor dog kennel, RV parking, various fruit trees: peach, cherry, apricot, apple, orange, lemon, grapefruit & avocado. Concrete drive to barn has room for horse trailer, truck, RV &/or boat. 3 car garage is attached with custom cabinetry and is 28x23 & fits a full sized trucks.